My passion for Atlantic Salmon Flies has not waned, rather it is getting stronger. Just like anything else, the more I dress, the better my flies look. Am I getting better? – Perhaps. One thing I'm sure of: I can handle materials much better with more patience and extra time. Along the way I acquired more books. Some of which helped me build skills and mindsets. 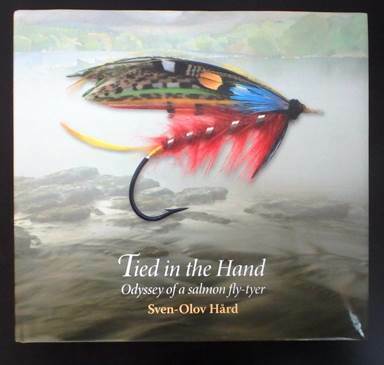 Also there have been books that offer me imaginary trips to unknown places and rivers, where I'm casting my own salmon flies for Atlantic salmon. So suddenly I'm reading and learning from another World-Class master, this time, from the heart of Atlantic salmon "fishing" region. As the title suggests, author dresses with his hand, NOT using a vise, what he calls Hardy Style. He uses authentic materials. Then he actually goes fishing Atlantic salmon with those flies! This book (Coch-y-Bonddu Books, ISBN: 978-1-904784-51-8) is very organized with full of contents: historical review, materials review, dressing instruction, and author's personal journey. His flies are as classic as they can be; a great reference right on my bookshelf. As of now, I haven't tried to tie in my hand yet. Someday soon, I will. I don't mean to permanently do so but who knows. Another personal note is: when we think of and talk about trout flies, if they catch some trout in America or even in one particular stream somewhere in US, they are considered effective and tyers can be famous. With Atlantic Salmon Flies, certainly one can claim to be good. But look around not just in US but also worldwide. I'm working alone in my little house in the windy town of Livingston. I might be good in my own right and could be better. However I never forget my initial learning attitude and keep my eyes and ears open to worldwide.